JDub’s Brewing Poolside Can Packaging | Commit Marketing | A Full-Service Marketing, Web Design & Development Firm Located In Sarasota, FL. 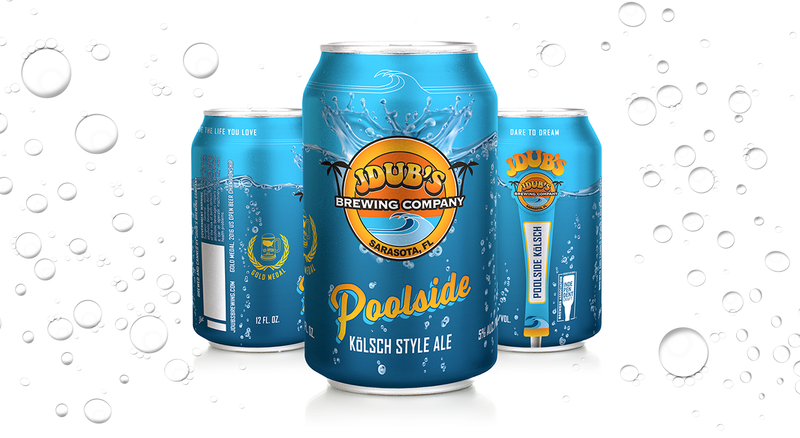 With a firm footing inside grocery stores, liquor stores and restaurants throughout the state of Florida, JDub’s Brewing was ready to refresh the packaging for their Flagship and award-winning Poolside Kolsch. Growing into their fourth year in the craft brewing industry, JDub’s looks to continue bringing great beer to their increasingly appreciative, and educated consumers. It was clear, a refreshed design for this crisp craft ale was needed to reinforce and highlight the brand and experience you have with this product. A major goal of Jeremy Joerger, JDub’s Founder and CEO was to create a new design standard for their entire line of craft beers in distribution. 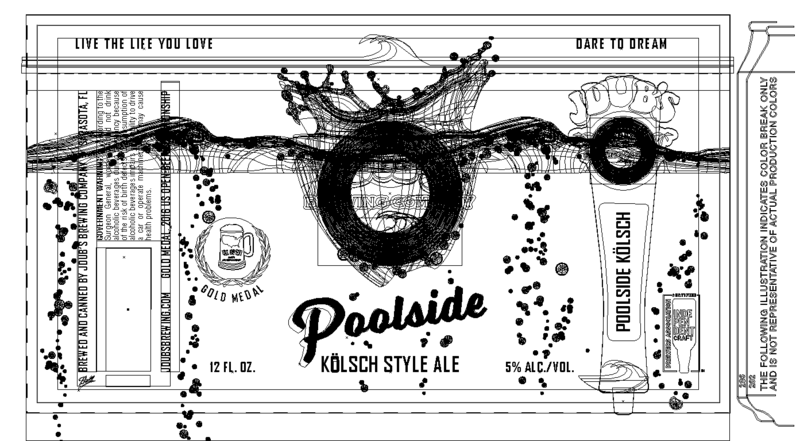 Starting with Poolside, the design needed to stand strong alone yet driving uniformity across the entire packaging line of flagship 6-packs in distribution. We can’t lie, when we’re in Southwest Florida, near some form of salt or fresh water, Poolside Kolsch was sipped on a time or two. Collectively our team was ready to be part of the process to present concepts for this can design. We dove in (pun intended) and learned even more about their brand, brewing / canning process to help aid our upcoming exploration. Mood boards and word associations were created to help align and get our ideas down on paper. Our team was challenged to present a new layout that would lay the foundation of future Flagship beer can designs. The result of our exploration during the discovery process led us to deliver a few solid sketches to consider for the future of the can. Our can concepts were driven by thoughts indulging in the refreshment of an upcoming vacation, poolside party or the moment your toes touch the sand. The chosen design direction was to highlight an underwater experience and to introduce their tap handles that would be featured on all future Flagship can designs. With the plan in place our team at Commit illustrated this water and bubble-inspired can design that highlighted their in-store and on tap brand experience. We collaborated closely with JDub’s team to edit and update the design as needed to capture their vision with the end product. Once the sketches and the design direction was approved we set a time to speak with Ball Metal Beverage Packaging Division who continues to support JDub’s and the majority of aluminum can needs in the industry. We had to be sure we would deliver a design and file that would meet their strict requirements and that our team was well versed with their printing process. We learned that we had a maximum and choice to use six Pantone colors plus the aluminum can to show through as an additional design element.